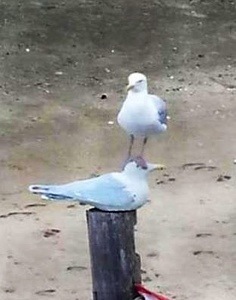 Have you ever been the seagull who was on top? Causing anxiety and pressure to those around you? Or do you try to live a peaceful life like the seagull on the bottom minding your own business when sometimes life just seems to try to get the best of you? Life is good, and we have so much to be thankful for! There’s no reason to take any crap from anyone ever! Embracing life filled with LOVE, AWE and WONDER!